The Xiaomi Mi Band 4 has received Bluetooth certification today indicating a launch in the near future. Just a few days ago David Cui, Chief Financial Officer at Huami said the fourth generation tracker will land in 2019, just not in the next few months. Huami is the company that manufactures Xiaomi’s flagship activity band. 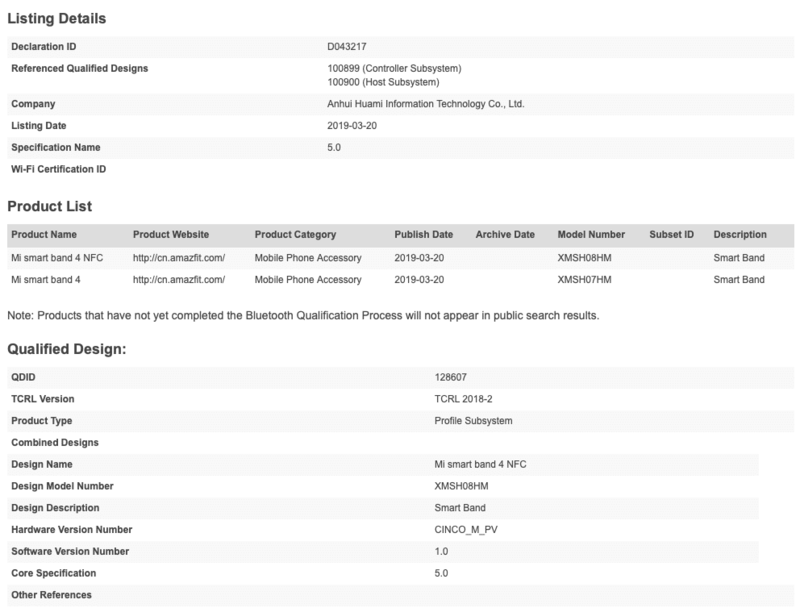 As spotted by Tizen Help, the fourth generation device has received Bluetooth certification now from the Bluetooth SIG. This is a global community of over 30,000 companies serving to harmonise the vast range of connected devices around us. Two models have been registered, a regular and an NFC version. The first goes by model number XMSH08HM and the second by XMSH07HM. The only other info that was revealed is that both will support the Bluetooth 5.0 Low Energy standard support. We were expecting an autumn launch but this certification implies that an unveiling in the summer months is not out of the question. Taking into account Cui’s comments, an earlier launch seems unlikely. The current version is one of the best options for those looking for an inexpensive fitness tracker. It comes with a stonking 20 day battery life, 5 ATM water-resistance, heart rate tracking and more. But there is lots of room improvement. This includes the screen which is not that great, there is no altimeter for counting floors climbed and the band does not track swimming. There’s also no built-in or Connected GPS and the performance metrics are fairly basic. Xiaomi will, of course, want to make sure any additional features do not compromise the low selling price. When it lands expect something that sells around the $30-$35 mark. The display cannot be read under the sun, which is pretty disappointing. My wish is that they will design the display so that it is readable under the sun. I am willing to charge it more often if it does that.